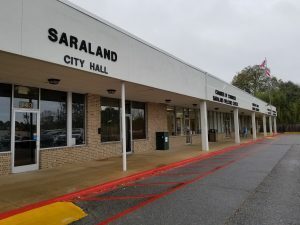 Saraland’s City Hall has moved to 943 Saraland Blvd. South. The City government, as with most governments in the United States, is divided into three branches – legislative, executive and judicial. The Council serves as the legislative branch enacting ordinances (laws). The Mayor is the executive branch. The court system is the judicial branch. Each very important and separate from the other, with its own distinct purpose. Municipalities within the State of Alabama are governed by laws of the United States of America and the State of Alabama. The Code of Alabama gives guidance toward specific powers and responsibilities of the state, county and local governments. The Ordinances for the City of Saraland are codified and available online at municode.com.